This one day course is aimed at paediatricians at all levels of training to improve their skills in interpreting normal and abnormal ECG in neonates and children of all ages. 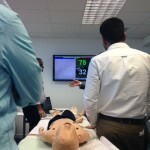 The simulation component is aimed to provide hands on training to improve confidence in diagnosing and managing common paediatric tachyarrhythmias. Click on poster below for more details. Advanced Communication Skills Training - 2017 Dates to be confirmed soon. This two day communication workshop is aimed at those working with children & young people. See poster below for more details! Click below for more details! We are delighted to announce that we have added another date for this very popular paediatric ECG course. Places are allocated on a first come first served basis, so don't delay! Click link below for more details! 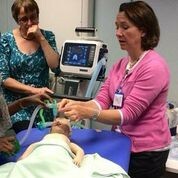 The BASIC course is a foundation course in Paediatric Intensive Care which aims to deliver improved outcomes for critically ill and injured children worldwide. 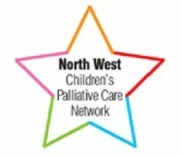 This was the first time that this course was held in the UK delivered jointly by consultants from Royal Manchester Children's Hospital and Alderhey Children's Hospital. 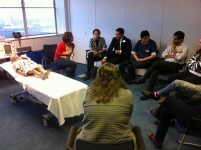 Human Factors Study Day Hailed a Success! RICON communication & human factors study day on 8th September was deemed by all to be a huge success. 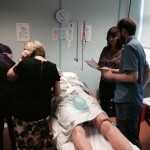 The day involved guest lecturers from around the North west and simulation sessions. One of the guest speakers was Lieutenant Colonel Mary Cardwell from Manchester 207 field hospital. Dr Cardwell, who is also an ICU consultant delivered a very engaging lecture on the military experience of communication and human factors. Click link below for more information. Do You Work with Children & Young People and are Interested in Developing Your Communication Skills? Click link below for more details. We are delighted to host the follow up to the Manchester Preoperative Study Day held in June. The programme is a multi disciplinary meeting with lectures and workshops. ManCEL has been selected to continue to host 'How to manage meningococcal disease' simulation training by Novartis Vaccines & Diagnostics. Four new dates have been added to the existing program. This invaluable training is FREE and is aimed at all grades of nurses and doctors working together as part of a multidisciplinary team. This course is accredited by RCPCH. Advanced Communication Skills Training - New dates Added! We have added new dates to our schedule for Advanced Communication Skills Training for those working with children and young people. This two day workshop is aimed at professionals who have challenging conversations during their work, with patients, families or colleagues. We are excited to be delivering this course again following the huge success of the last course. New date is Friday 13th June 2014. Click link below for full details. 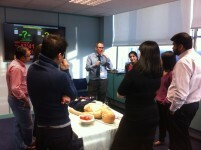 On 7 February, we hosted our first paediatric ECG simulation course. 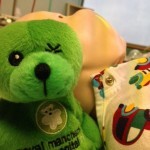 The day began with lectures from leading paediatric cardiologists from Royal Manchester Children's Hospital. 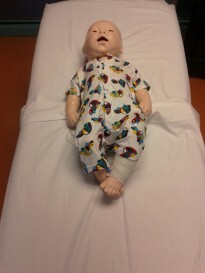 The afternoon was comprised of simulation scenarios using baby and child simulators. 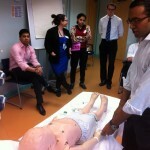 Candidates were asked to manage the patients and interpret 12 lead ECG's. 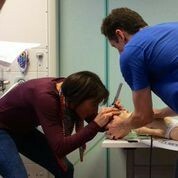 “Great Course, relevant to clinical practice”. 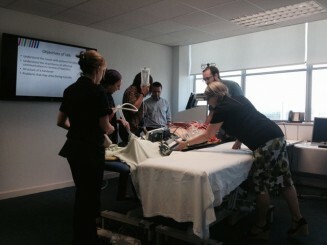 “Real-life scenarios – using actress – really helped, the simulation suite also helped to create some realism"
The first course is scheduled for 14 March 2014. 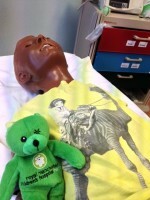 North of England Paediatric ENT Training Day - a resounding success! Three deanerys, North West, Mersery and Northern, came together for a training day for their Specialist trainees. The day consisted of lectures and simulation scenarios and was sponsored by Cochlear. Candidates described what a great learning opportunity the day was. APLS embraces the festive period! 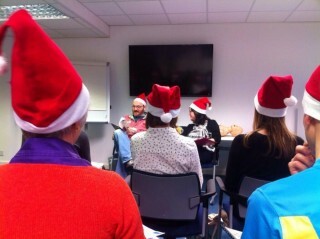 Santa's APLS elves flew in to assist with the course on 3 & 4 December. Candidates experienced fabulous advanced paediatric resuscitation training alongside a little festive cheer and mince pies! 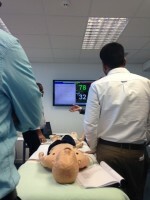 New Paediatric ECG Simulation Course to be held at ManCEL! We are working alongside Dr Joydeep Mookerjee & Dr Jaspal Dua, both Consultant Paediatric Cardiologists at Royal Manchester Children's Hospital, to deliver a paediatric ECG simulation course in the Northwest. The first course will take place on 7 February 2014. We are running a free morning session on 13 December 2013 for CMFT employees to brush up on their advanced paediatric skills. First 'How to manage meningococcal disease' course hailed a success! Twelve candidates attended assisted by six faculty. Both candidates and faculty members expressed how much they gained from the course and enjoyed the day. 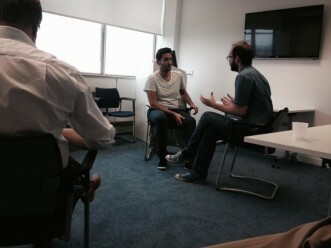 Candidate feedback "I enjoyed getting different aspects of all multi-disciplinary team members and their knowledge".
" I most enjoyed looking at different aspects of leadership, communication and teamwork within the small group". We are hosting an official open day on 2 October 2013. 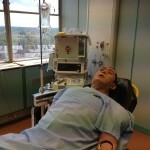 We invite you to drop in during the day to experience what our simulation centre has to offer. Meningococcal Disease Course - Comes to the Northwest! RCPCH - How to Manage Meningococcal Disease Course is being delivered by us here at ManCEL. This is the first time that this course has been delivered in the Northwest. Leading the course is Professor Ralph Mackinnon. Click courses tab for upcoming dates. Delivered by Connected in conjunction with National Cancer Action Team (NCAT). The course focuses on those caring for children and young people (CYP) providing them with bespoke communication skills. 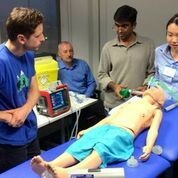 Advanced Paediatric Life Support (APLS).